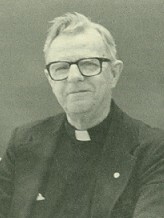 The searchable theological works of the late Fr. William G. Most (bio), an internationally-acclaimed theologian and Scripture scholar. View the complete list of titles of more than 230 theological works by Fr. Most and select any work for reading or download. Use the Most search screen to look for key words and return all the paragraphs which contain what you need. The late Fr. William G. Most was one of the most distinguished Catholic teachers, theologians and Scripture scholars of our time. His long teaching career, extending well over 50 years, was marked by unswerving fidelity to the Magisterium of the Church, theological brilliance, and an ability to communicate clearly to layman and professional alike.